When we gathered for Indian food after last Sunday’s caucus, the three newly elected delegates posed for pictures. Look who just got elected to represent us in the Democratic National Convention in Philadelphia! 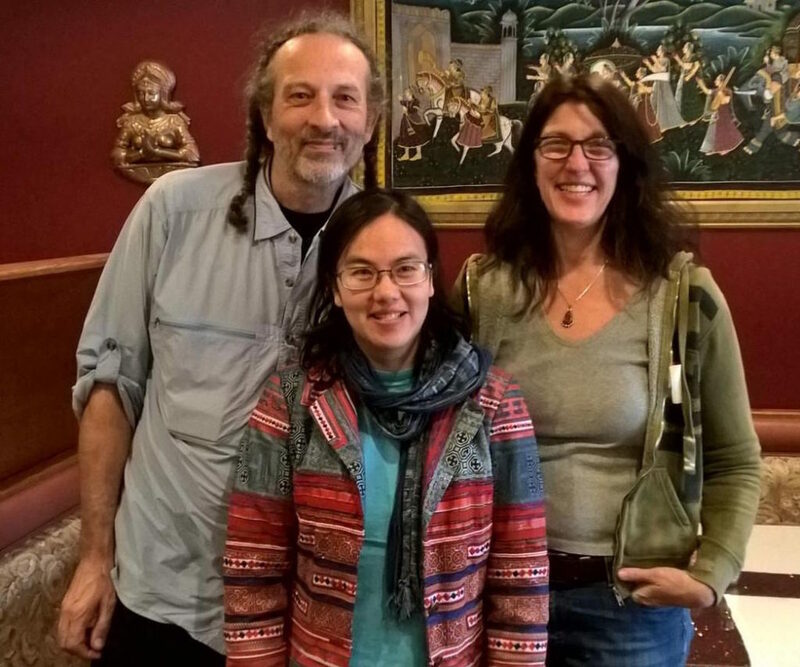 Obbie King, Xong Xiong and ALICIA LEINBERGER!!! Matthew LaRonge is not pictured. A little birdie named < redacted > told me that you’ve been selected to be a delegate at the DNC in Philadelphia. Congratulations! Feel the Bern! With the reality of an impending trip to the DNC (to the INSIDE as a delegate, instead of to the “free speech zone” as a protester) still sinking in, I wanted to send out a brief thank-you note to all of you who voted for me at the CD caucus. I am truly grateful and overwhelmed by the support of so many of you, especially those who I had never met before that day. For those who did not vote for me… I won’t hold it against you. There were many good people on the board, and I’m sure that we all wish that EVERYbody could go. Whether or not Bernie gets onto the general election ballot (making that happen is now part of my job description), we must sustain this movement thru this election and thru every election of the foreseeable future. In the event that Hillary (–shudder–) is at the top of the ticket, there are many good and worthy candidates elsewhere on the ballot (from Russ Feingold on down) who can use our energy and support, whether that takes the form of money, phone-banking and door-knocking, or general hell-raising. The work we need to do will take more than one election… it may take a lifetime. But if we keep working, we will live to see young people thanking us for the work we did rather than condemning us for ignoring the crises we faced. So let’s all keep at it in any way we can! And thanks so much for all of your support. First – for those of you on FB, please somebody make a Third CD for Bernie page…. I refuse to be on FB but I know a lot of people haven’t seen the light yet 🙂 and it’s a good way to share info with lots more people. We will also make sure to put all our delegates’ GoFundMe pages … at lacrosse.wi.forberniesanders.com (by later tonight). I hope that the other three delegates – Obbie King, Xong Xiong, and Alicia Leinberger, will also set up GoFundMe pages. See Matthew’s info below. If each county could host one fundraiser for our delegates and individuals contribute what they can, it should help a lot! We were told at the training session that costs would be $2,000 to 4,000 per delegate (but this includes discretionary spending for sightseeing and other extras). If every 3rd CD Bernie voter kicked in $1, we’d have it made! She had a lot more to say than “please someone set up a Facebook page” and “I wish the delegates would set up their GoFundMe pages already.” A lot of the message addressed keeping track of where Ron Kind is appearing so he could be convinced to cast his superdelegate vote for the candidate selected by the voters of his district: Bernie. But she’s not subtle in her encouragement to set up a GoFundMe campaign. I’ll have to get on that tomorrow. This entry was posted in Preparing to Go to Philadelphia. Bookmark the permalink.